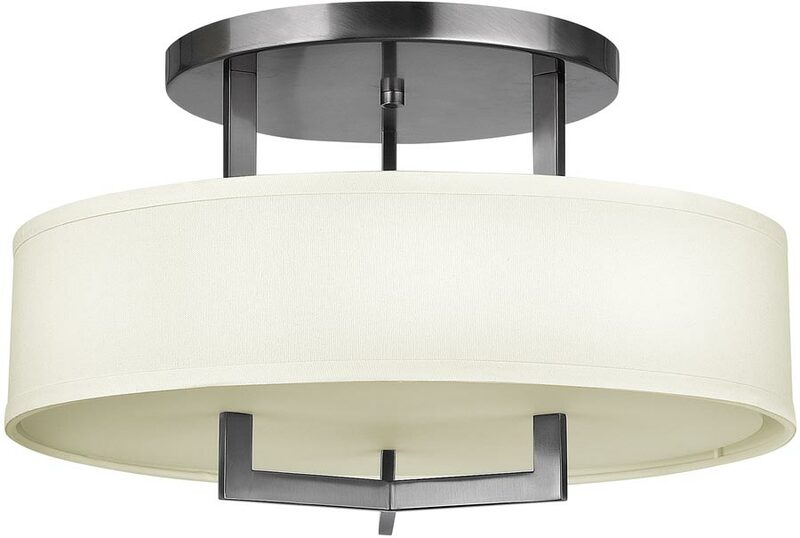 This Hinkley Hampton antique nickel finish 3 light linen shade semi flush ceiling light, with large circular ceiling mount, tall three-sided angular frame and central suspension supporting the lamp holders; surrounded by an off-white linen shade fitted with an etched acrylic diffuser for a softer light. A modern, sophisticated design offering the ultimate in urban chic; perfect for any modern space with a lower ceiling. Part of the contemporary Hampton lighting range finished in antique nickel. Other fittings in the Hampton contemporary lighting suite can be viewed below and include single and two lamp wall lights, three different sized pendants and a chandelier. Supplied by Elstead Lighting and designed in the USA by Hinkley Lighting, founded in 1922 in Cleveland, Ohio. Their long heritage combines with a pursuit of innovative design to create modern and contemporary lighting like the Hampton antique nickel finish 3 light linen shade semi flush ceiling light you see here.